Like many of you, I have a stack of books sitting on the night stand waiting for me this summer. Though I have a Kindle and read many e-books, I still love the feel of a hard-bound book. I should explain I have a unique view of this kind of thing. I like books and I particularly like woodworking books, so to encourage companies to publish more of what I like, I buy their products. I may not absolutely like every book a company publishes, but the only way to make sure they do get to the ones I like, is to buy stuff from them. Mike Dunbar up at the Windsor Institute explained this to me in detail when I went to a class at his school. He recommends a spoke shave made just over the mountain by Dave Wachnicki at Dave’s Shaves. Dave runs a small operation and as Mike explained, if nobody buys his products, then he will go get a job in a factory and stop making them and we will all be the poorer for it. Consequently, I have most of the books published by Lost Art Press. 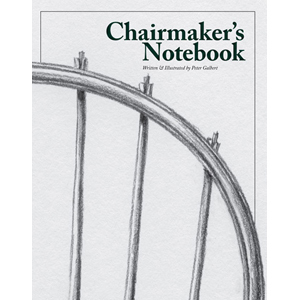 Peter Galbert’s “Chairmaker’s Notebook” I took a class from Peter a few years ago at Highland and made a child’s Windsor chair. (It’s on display at the Store, by the way. Look up front by the windows.) Peter is a wonderful teacher and passionate about his work. I like Windsor chairs and have made several. This book makes it look easy, which is an indication of Peter’s prowess as a writer, teacher and chairmaker. It only looks easy because he is so good at it. 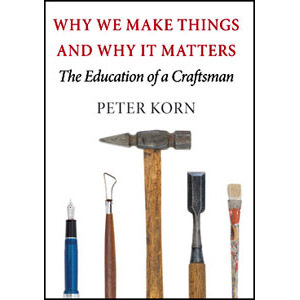 Peter Korn’s “Why We Make Things and Why It Matters” A verbalization of all those things you know instinctively about things you like and like to make, but cannot say out loud. Peter writes them down for you. Roy Underhill’s “Calvin Cobb, Radio Woodworker” Roy’s first novel and it has measured drawings in it. Really. 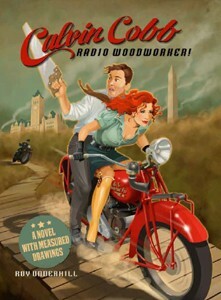 Everybody enjoys Roy and his woodworking and you would know he wrote this even if his name were not on the cover. Geo. 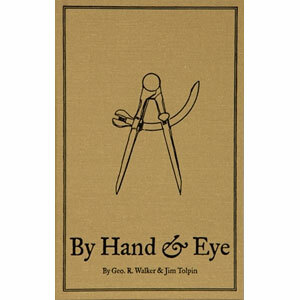 R. Walker & Jim Tolpin “By Hand and Eye” This is another one you know instinctively, but these guys wrote it down. They are able to quantify those things that many of us can see when we are looking at a nice piece of furniture or a building. I love being able to do things the old ways with the most basic of tools. Will Holladay’s “A Roof Cutter’s Secrets” Nerd city and not available from Highland. In another lifetime, I would be a roof framer, but since it is too late in this life, this is my vicarious profession. I love the math and the practical aspect of the work and the fitting together of the puzzle. I have the greatest admiration for the old cutman with a fourth grade education sending perfectly cut rafters up top without ever climbing onto the roof. With a little apprenticeship, I could do that thirty years ago. That’s my reading list. What’s yours?